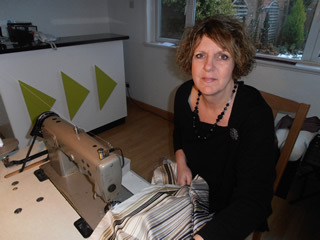 Hello my name is Jane and I have been a curtain maker in the Dartford, kent area for the last 25 years. I have decided to open this shop as an extension of my home run business, we are not part of a chain or a large department store who often will sub contract out your work to a third party. During the whole process of choosing your fabrics and making your curtains or soft furnishings you will only be in contact with two people, my representative in this shop and me the curtain maker. You may also meet my husband if you require a fitting service and in this case I will personally accompany him to ensure that your new addition to your home is fitted and shown at its best. This is the personal service that I have been providing over the last 25 years and is also the reason I have never had to advertise. I will make the curtains to your specific requirements lined with ivory solpruffe cotton sateen as standard with hand sewn sides and hems, mitred corners and weights. Other linings available are blackout, bonded or interlined which is another layer of insulation added between the fabric and the lining. Blinds can be finished with a contrasting border or trim such as beads, pom poms, tassels or eyelets, a roman blind when combined with a curtain can give an exquisite look to complete your window design. There are a large variety of pelmet and valance designs whether you want to be minimalistic or opulent, they can be used to hide unsightly rails and are a stunning focal point of the room. We make handmade wooden pelmets any shape to match or contrast your curtains or blinds creating a contemporary look, they can be made from a variety of materials and finished with a multitude of trims. All joints in our woodwork are glued to ensure you are provided with a sturdy product so when removing it remains in one piece. Even intricate bay window wooden pelmets can be made this will entail a pre-visit to construct the template. Valances, swags and tails add a softness to your window and give a more elegant and traditional feel with plenty of styles to compliment your room and taste. Tie backs finish off your window dressing, can be made various widths and shapes, numerous decorative touches can be added to enhance the finished look. Curtains are expensive so instead of replacing them why not alter and restyle. Transform curtains into roman blinds. Make a roman blind from a quilt cover to match your bedroom. Eyelet insertion, due to the recent purchase of an eyelet machine we are pleased to offer an eyelet fitting service with a vast selection of colours available, we are able to transform your existing curtains into a stunning eyelet design. Pretty pleats is owned by the curtain maker so anything is possible, we are happy to use your own fabrics for an unlimited choice of style and budget. Free consultation and estimate in the shop where you will find a large selection of quality fabrics on offer including plains, traditional, contemporary, self patterned and florals at competitive prices. Free measuring service and quotation, I will bring your chosen fabric samples to your home so you will be able to view colours and textures with your existing furnishings. I can advise on the design of your window treatments to suit you and your lifestyle as well as compliment the looks of your home. Free loan of our extensive range of fabric books and hangers. Fitting service available at an extra cost. British Fire Safety Standard BS5867, fire retardant treatments available. Eyelet insertion, due to the recent purchase of an eyelet machine we are pleased to be able to offer an eyelet fitting service with a vast selection of colour rings to chose from. We are able to transform your existing curtains into a stunning eyelet design.